Donald Trump has decided to retrieve from the Paris Agreement. His move was certainly meant to strengthen the economic situation of the United States of America. However, only a few hours after his public announcement, the situation quickly evolved into a tremendous geopolitical shift. The international answer was swift and strong. First of all, most of the leaders of developed countries around the world publicly disapproved the decision of the American President. Futhermore, the event has given more international weight to the big player of the moment, China, which reassured its commitment to act against climate change in reducing the use of fossil fuel, to the advantage of renewable energies. According to Professor James Renwick from the School of Geography, Environment and Earth Sciences at Victoria University: “The Chinese are going to take over here and I imagine the balance of power will shift in that direction.” Now, there is a much more united posture between Europe and China, followed by other superpowers like Russia. Even in the United States, great states like New York or California won’t presumably follow Trump’s blind politics. Moreover, most of people in the world experience how the release of greenhouse gases due to the use of fossil fuels like gas or coal is deeply affecting the weather and the whole planet. Poles and glaciers are melting away the more quickly each month, storms are getting stronger and oceans acidify away. We, islanders & coasters of the Pacific, are certainly most concerned by those threats, since the rise of sea level will leave us no other choice, if nothing is made, than leave, one day, our homelands. By the way, movements of resistance have already emerged all around the Pacific. In New Zealand for example. According to radionz : “The move has been viewed in New Zealand as a step backwards, not only for climate change but for the US as a powerful player on the international stage”. In California, the silicon valley guru Elon Musk (Tesla, SpaceX) stated on Twitter : “I am departing presidential councils. Climate change is real. Leaving Paris is not good for America or the world”. Pacific island groups have also begun to fight back, describing Mr Trump’s decision as “a grave moral injustice”. 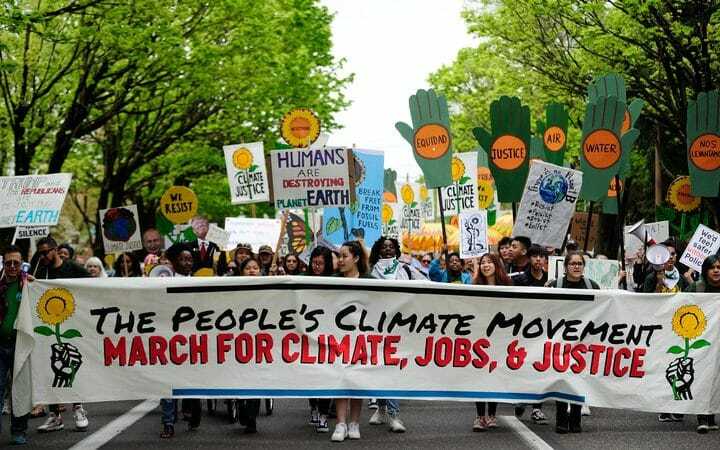 The Pacific Islands Climate Action Network stated clearly that the American President, while defending fossil fuels, threatened directly the people of the Pacific. Moreover, the group asked Australia to reaffirm its engagement to the Paris agreement. For Krishneil Narayan, co-ordinator of the Pacific Islands Climate Action Network: “Certainly we are really angered by the announcement. The United States is one of the largest carbon polluting countries. We here in the Pacific island countries are really going to double our action to help with ensuring that the world is going to support the Paris agreement and implement climate action”. He also added that Fiji’s presidency of UN climate change talks this year will give more weight to these actions. As we can see it happening right now, Trump’s move has united the rest of the world against him, and the old paradigm he incarnates. The USA will eventually be severely weakened by this event in the months to come if the country sticks to this blind politics. In a glance, Trump stance has greatly impacted the credibility of the USA and may have triggered a new political balance, with a shift of influence towards Asia & the Pacific. We hope this will mean, in the end, that our Pacifican children will be able to live in their homelands in the centuries to come, like we do today, and like ours ancestors did before us.